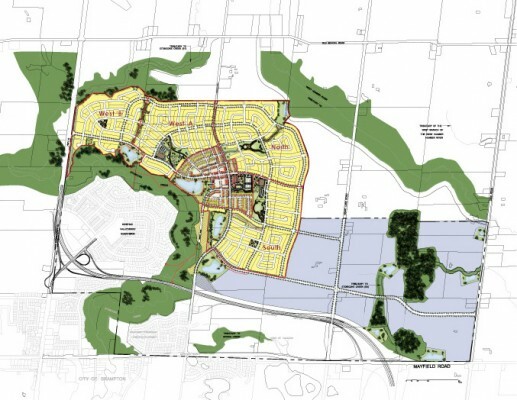 Mayfield West Community – Bousfields Inc.
Bousfields has been retained by Monarch Developments and their partners to provide planning services for a number of phased subdivisions in the Town of Caledon’s developing Mayfield West Community. The Mayfield West Community Development Plan provides for the development of a community of approximately 9,000 people and includes an urbanized village centre surrounded by three valley systems, four residential neighbourhoods, two elementary schools, neighbourhood parks, a community centre and a greenway open space system. Bousfields is responsible for the preparation of various plans of subdivision, a Planning and Urban Design Rationale report and draft zoning by-laws. The development of the Mayfield West Community is ongoing.